I have been waiting forever to watch this anime. its been on my want list since it was a light novel in japan. this anime is about a school that teaches History class about Sega Hardware. If you love video games and Sega products, im sure this anime will keep you entertained. the anime's approach reminds me of GDGD Fairies. Super weird animation style, (not a bad thing at all), classic games systems given animorphic forms and just plain craziness basically sums up the first ep. All in all its off to an amusing start. If your not used to the animation style it may throw you off the series from the get go as its anything but typical for modern anime, though I myself find it acceptable. The characters themselves fit the typical mold. Sega's the straight forward sort that speaks her mind. Dreamcast is to be blunt, a loveable idiot, and Mega Drive is the blunt one that gets straight to the point without any nonsense...so far anyways. The anime appears to run in shorts, with the first episode running about ten minutes not counting credits. Goofy characters, fun art style, a unique story/world set up while still using classic forms of anime and for the heck of it a random chibi to normal size transformation sequence upon entering the game world just because. I can't give this a five star for the simple fact the motions of the characters to me are distracting with random movements of the body for no reason. Its minor and easily overlooked however. All in all its worth the ten minutes, give it a shot. To be this good takes Sega! Ah, the sound of nostalgia. Now I've got that out of the way, let's review Hi-sCool! Seha Girls. The Sega Hard Girls are anthropomorphized versions of various game consoles developed by Sega, some of which you may have heard of such as the Mega Drive and Dreamcast to some little known ones like the Sega Mark III and TeraDrive. The girls have appeared in their own light novel written by Tōru Shiwasu with illustrations by mangaka KEI, whom also provided artwork for Hatsune Miku and the Vocaloids and have even crossed over with Hyper Dimensions Neptuna in a game for the Playstaion Vita. The 13 episode anime series which aired in 2014 takes place at the fictional Sehagaga Academy, located in Haneda, Tokyo, which is attended by three of the Sega Hard Girls. Dreamcast is the typical cheerful ditzy girl who wants to be everyone's friend and do well in school. She is also capable of connecting to the internet via a dial up modem (much like the Dreamcast console). Mega Drive is the token smart girl with a vast amount of knowledge thanks to her 16-Bit encyclopedia which she carries around with her. Then, there's Sega Saturn, the more serious of the trio seeking to accomplish great things in life, who also finds herself to be the object of affection of various Sega characters such as Gillius Thunderhead from Golden Axe. Their classes and taught by a digital rabbit named Centre-sensei, who is voiced by Yuji Naka (a former Sega employee in real life) with their classes based on various Sega games where each of the girls earn medals for doing certain assignments in the games they enter through the classroom's TV. If they earn a total of 100 medals, they graduate from the school. What's interesting about this series is that it's animated using the MikuMikuDance software with the characters rendered in cell-shading giving the characters a hand drawn look. The episode's stories revolve around the girls classes in various Sega games where they undertake various assignments and meet different characters in the game worlds. And yes, even Sonic the Hedgehog shows up in an episode. The story in fun and enjoyable and it's character are colourful and charming and the game worlds they enter are faithfully recreated. The series also makes nods and references to various Sega games. My only issue I have with the series is it's 13 episode length. I feel that the series could have been longer and created more possibilities to include more Sega games in the story. I personally would have loved to see them tackle the original Shining Force game for Mega Drive as well as Streets of Rage. And this might sound more like wishful thinking, but seeing Alisia Dragoon at least get a mention wouldn't have gone a miss. I was also hopeful for Segata Sanshiro to get an appearance. While I felt that the series could have done a bit more, I really enjoyed it. It's well animated, funny, and well written with some loveable characters and a shining testament to a company who once showed the world that "to be this good takes ages". 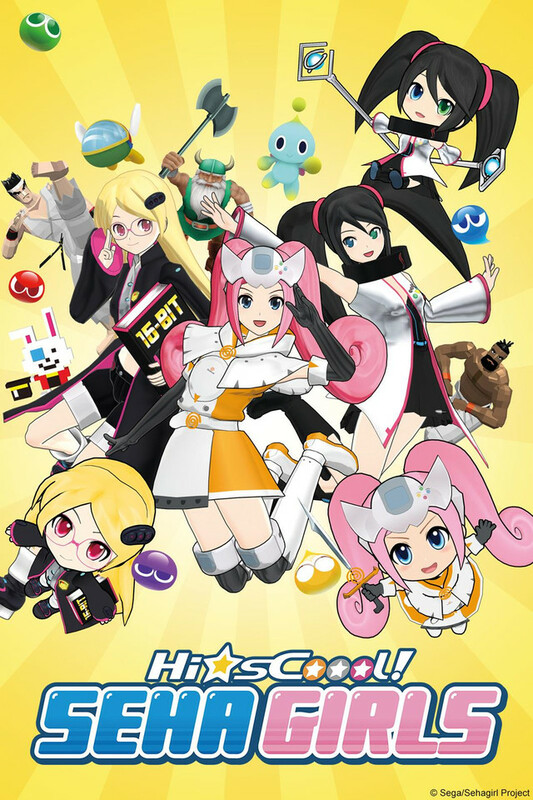 Seha Girls is a series I highly recommend to both anime buffs and Sega/game fans alike. A fantastic series that's a fun watch sharper than a Cyber Razor Cut! At simple look back on SEGA. It could've been more. This show takes the idea of video game console's being anime girls, and....It happened. Instead of Sonic boom for the wiiU/3DS, this was what japan got. To be honest, I can't tell which was better. This show makes everything all tiny and cute with sega franchises pasted all over the place, even if they don't show up anymore. The characters go into SEGA games to do various task so that they can graduate. The main characters instantly take up the suspected personalities you see in every show that surrounds itself in high school's, you have the quiet/shy girl, the Loud,chreey and random one, and the normal but slightly off one. Seem's cool on paper, but this show unfortunatly makes it seem like a let's play video off on youtube with small pictures of the main characters thrown in the middle. This truly kills the animation of the show and it fails to introduce any additional characters as the show goes on. SEGA had various other console's as well as consoles just having different names on them for specific regions. They show mentions them only once, then they're non-existent for the rest of the series. ( SGEA genisis, Game gear, and the SEGA MARK 3) They could have potentially have been characters that would've helped develop the show but again, they're only mentioned once. Not only that, those following characters aren't even given the same art style as the main characters. They're just hand drawn illustrations that don't move- they don't even change positions. The show does touch up on sonic a bit, it looks like it could have been planing on having other games that weren't touched up on since they get mentioned at the end. Characters in the video game worlds have little to no voices, Sonic doens't even speak. by the end of the day this turned into a simple cartoon by sega to say they have games other than sonic, but it's almost impossiple to find unless you look hard enough. They tried but it didn't work out. I started this show expecting the worst but was quite surprised how easy a watch Seha Girls was. It's not a show I would whole-hardheartedly recommend as it doesn't have much going for it in the story and character department. Though it is a fun ride through Sega land. There are a few other problems such as the show often feeling like a kids show, which is odd because I can't see a show about Sega fandom appealing to anyone under 18. It also sometimes feels like an advertisement for certain games, which is weird since all the games but one smartphone game are 15-20 years old. Still, it was fun to see our characters jump into various Sega worlds. I would have liked to see the original Phantasy Stars or Panzer Dragoon, but the variety here was quite impressive. Also, the half length episodes were perfect for a show as silly and gimmicky as this. A lot more shows would be worth watching if they decided to go this route. They play through your nostalgia. Very cute, fast pace, colorful, hilarious, short show! The old gaming consoles has been given life and plays though a variety of nostalgic games in order to graduate. Spoiler free, the ending is very nice and hits home, turning the water works on. At different points in my life, I owned all 3 of these consoles. to this day, I still own a Genesis with Sega CD that's still in perfectly working condition. Sega means a lot to me. That's why at first, I was apprehensive about an anime turning these consoles into animate objects. I also am a traditionalist in terms of enjoying 2D anime and I don't usually like the CGI ones. However, after seeing the girls jump into some of my all-time favorite games (like Virtua Fighter), I get why it's CGI and it completely works. A great trip down memory lane! I have to say, I expected this to just be a SEGA fanboy's dream, but to be honest, it was still pretty entertaining. Of course, I'm a pretty big SEGA fan, but a lot of the dialogue doesn't feel bad. Characters are pretty standard, but fun, and a lot of the comedy is based on how crazy the situations can get. A rare chance for Sega's important contributions to gaming history to shine. As a Sega fan, I was delighted to see a series dedicated to Sega and its console history. By default, classic gaming discussions are usually dominated by Ninentdo's contributions...so for once Sega gets its much deserved moment in the spot light. If you like classic gaming reference (in particular SEGA classic gaming references), there's no reason why you shouldn't have already watched this.